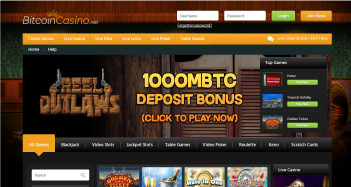 Below is our BitcoinCasino.net review which we rate as a slightly above average bitcoin casino. Truth be told there’s not a ton of information out there. And it’s hard to tell if what is out there, is accurate or not. For example, many reviews state they just got started this year (2014). But BitcoinCasino.net has said multiple times they got started in 2011. The year they got started isn’t terribly important. But if no one can get their dates right, you’re left to wonder what other facts might be skewed. So we’ve done our best to research their casino and present you with the facts needed to decide if they’re the right casino for you. I think you’ll find they have a solid (and albeit small) deposit bonus, even better play through requirements and a ton of games. They just need some work in a few areas. Right now BitcoinCasino.net is offering a 100% match deposit bonus up to 1 bitcoin (around $325). What I like most is the play through require – 35x the bonus only. Most casinos make you play through both the deposit and bonus. So this is like getting 50% off. But keep in mind that it does depend on what games you play. Games with better odds will be worth less than games with worse (house) odds. You might have to play more to clear the offer. All other games (lottery, dice, etc) won’t count at all. This is nothing new. 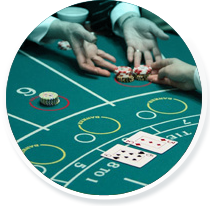 Most casinos handicap games like blackjack or craps to make the promotions fairer for the casino. This promotion is still better than most thanks to the (bonus only) rollover requirements. 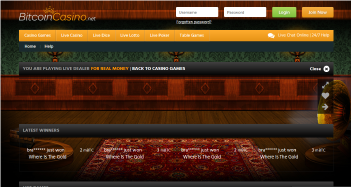 Bitcoin Casino gets their games from CoinGaming.io. These guys aren’t software providers – at least from what I can tell. They’re more like a broker or distributor. They get their games/software direct, package them up and sell/lease them to operators. 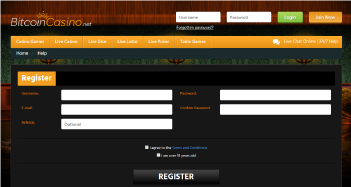 Most, if not all the casino games for BitcoinCasino.net come from BetSoft. These guys are the leaders in the 3D gaming space. At least that’s what this writer thinks. They have more than 200 games to choose. Here’s how it all breaks down. Their table game selection also includes live dealer games. 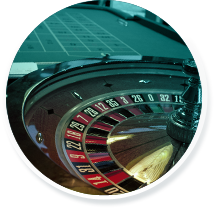 You can take your pick from live dealer blackjack, lottery dice games, baccarat and roulette. Unfortunately, while I was there I couldn’t get their live dealer games to load. Or their dice games. Their game section (with a list of all their games) wasn’t easy to use either. The navigation was broken, too. Overall, the site could use some polishing. If they fixed the broken stuff and made it a tad faster, I’m sure my experience would have been solid. On the bright side I did get several of their 3D slots themes to load, and enjoyed playing them (as I usually do). BetSoft makes great slot machines, especially if you like slots with bonus rounds and short stories (more like short clips or cut scenes). And the games did play fast once they loaded. The bottom line – I give them a B-. Just a touch over average. I like the site okay. You can’t go wrong with a large selection of (mobile-friendly) games and a simple deposit bonus with equally simple play through requirements. I only wish the site wasn’t so rough around the edges. With a little bit of polishing they could be really good.